Our Laser operators are fully certified and has advanced training in Laser Hair Removal – ensuring you the best results! Plucking, shaving, threading and waxing takes up a lot of our time, not to mention the pain factor. Imagine not having to continually worry about removing the hair from your legs, underarms, bikini line and other areas of the body – it’s a wonderful thought, isn’t it? At Redeem Medispa you can achieve this reality! A multi platform machine featuring the safest, most powerful and fastest laser on the market. It also features a new revolutionary virtually pain free treatment. At Redeem Medispa we have very effective equipment for hair removal on all skin types including South Asian skin and finer hair not treatable with other machines. 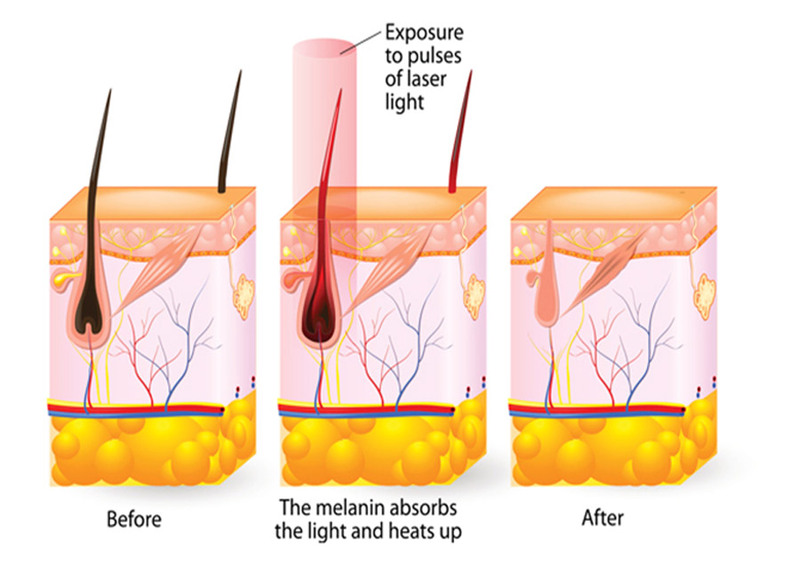 Combined with the expert laser technicians we can give the best results based on your skin and hair type. Book your free consultation and come and meet our expert technicians. The treatment area has to be shaved. Then clear gel is applied to the skin and the laser glides over the gel. Previously some lasers were considered to be painful, but with our modern technology today the treatments are quick and pain free. Although there is a dramatic reduction of unwanted hair, it is likely that a few hair follicles will not be completely destroyed by light treatment. Some people may experience some hair growth within a year, but this will only be the odd hair here or there and will be quite insignificant compared to the original density of the hair prior to any treatment. Many of our clients are extremely happy with their results! People with PCOS Polycystic ovary syndrome (PCOS) is a condition that affects a woman’s hormone levels. Women with PCOS produce higher-than-normal amounts of male hormones. Usually more sessions may be required. You can discuss this in your consultation. Redeem Medi Spa in the last two years is the go to place for me, my mum and sister for cosmetology purposes. All three of us purchased package for laser hair removal. Prior the purchase the specialist took time with each of us to access & determine the skin type, explain how everything works and when to expect the results, and after calculated the number of procedures required based on individual differences. I was served by different specialists and each of them did a great job! So it is not the case when the results are dependent on the staff who assists you since all of them are premium specialists. They are always ready to reply to all the questions and concerns.The results from the procedures I’ve received so far are amazing! Also, I’ve purchased the micro (skin cleansing) as a gift to my grandfather and he loves the results. The place is clean while staff is highly qualified and very friendly. The prices are reasonable and you will be provided with A+ service. Also, there are always promo going, so you can get actually a good deal while not rocking with your health! Come in for a free no obligation assessment to learn more about Laser Hair Removal treatments and if you are the right candidate to receive Laser Hair Removal.